Portable abstraction layers like portaudio are one way to address this problem, but this method does not address all the issues. Cards with obsolete drivers remain obsolete, and software installation and configuration remains difficult (actually, it tends to get more difficult, because of the need to deal with yet one more software component). An Ethernet connection to the sound card is a more complete way to solve these problems. If the sound card sends and receives samples using UDP or TCP, it communicates directly with the audio (or software-radio) application without passing through the operating system’s audio subsystem. The data still passes through device drivers on the PC, but now these are the networking drivers, which are built into all operating systems. Furthermore, the software interfaces to networking functions are essentially the same across all operating systems, unlike the interfaces to the audio subsystem. This makes it easy to write portable audio applications. The prototype. The green board is the EK-LM3S9B96 evaluation board. The CODEC is on the lower left. 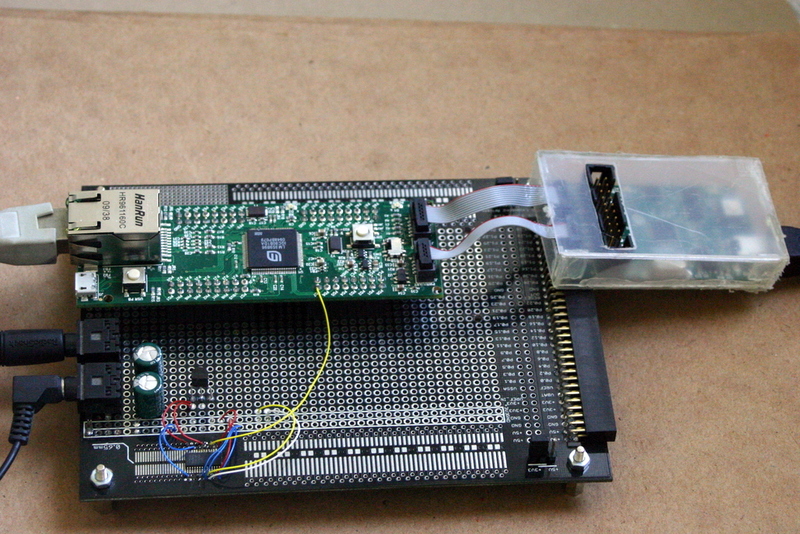 The board in the plastic enclosure is the programming and debugging dongle. To test this approach, I built an Ethernet sound card using a simple microcontroller evaluation kit called EK-LM3S9B96. The board contains a Texas Instruments LM3S9B96 with a 100Mb/s Ethernet controller (both MAC and PHY; all you need to add is the isolation transformer and Ethernet jack). This microcontroller also has an interface to audio DACs, ADCs and CODECs. I mounted the evaluation-kit board on a large prototyping board that also had space for the CODEC, a Texas Instruments TLV320AIC23B. The line-in port and headphones output ports of the CODEC are connected to standard ¼” stereo jacks. Getting the firmware to support 24-bit stereo 192kHz sampling in both directions was a real challenge. I ended up using TCP rather than UDP, which I originally thought would work well. But at the end the card works very well. An article in QEX tells the full story. It is also available on my university web site.